Until recently, the whole world of desktop audio wasn’t something troubling the big names of mainstream audio unduly. True, everyone from high-end companies to accessory specialists and even all-but-unknown start-ups had already gone down the route of providing digital-to-analogue converter bridges between computer and hi-fi systems, but it’s only recently that we’ve seen some of the best-known names joining in. Sony has added a high-resolution-capable DAC to its range in the form of the £500ish UDA-1, which combines a USB DAC and an amplifier to make a ‘just add computer and speakers’ system (although at the time of writing it’s awaiting the completion of drivers for Mac computers, perhaps as a legacy of the company’s Vaio-making days). The latest arrival in this arena is Denon’s DA-300USB, which – as the model designation suggests – is a USB-connectable DAC, and undercuts those rivals with a very competitive £329 price-tag. The format is pretty familiar, in that the DA-300USB is packaged in a compact enclosure – it’s just 17cm square and 5.5cm tall – also able to be used standing vertically (with a clip-on stand provided in the box) to reduce the amount of desktop space it occupies, while a clever switch to adjust the orientation of the organic electroluminscent display when so used adds a touch of class. It has a bit-transparent asynchronous USB input able to accept content at up to 24-bit/192kHz as well as DSD 2.8MHz and 5.6Mhz, which it handles using DoP (DSD Audio over PCM frames) – you can read more about this standard by downloading this document. The USB input’s interface ground circuit is isolated from the converter’s audio section to exclude noise from computers. Alongside the USB Type-B connection are the usual suspects when it comes to digital inputtery – one coax/electrical and a brace of opticals, all capable of handling up to 24/192 files –, a high-quality headphone stage with its own volume control and a pair of fixed-level analogue outputs. That last point is a bit of a pain – I mean, I can see that Denon intends this unit to be used with its own amplifiers, receivers or mini-systems, but a variable-level analogue output would open up the DA-300USB for use straight into a power amplifier or even with active loudspeakers. Yes, you can control the level from your computer when using the USB input, but you’re a bit stymied when using S/PDIF inputs unless you’re going into an amp with its own volume control. As it was, I tried the Denon with my own amplification and systems, as well as with a rather fine pair of active speakers (review coming soon) complete with their own volume controls, which required some juggling of levels but delivered an impressive taste of what could have been. Anyhoo, under the lid the DA-300USB uses Denon’s proprietary Advanced AL32 Processing, designed to ‘enhance the reproducibility of weak signals by expanding 16-bit digital data to 32-bit’, feeding 32-bit/192kHz-comaptible digital-to-analogue conversion. Independent master clock crystals for 44.1kHz and 48kHz are used to ensure incoming signals are clocked accurately at any sample frequency. The AL32 system has been refined by the company over many years, and found in its high-end players and DACs, such as the £1500 DCD-2020E SACD/CD machine. It’s a fine example of how technology trickles down the range (or is the modern term ‘cascades’?). Completing the package is an external plug-top power supply, while the DAC itself has a switchable auto-standby function. In use, the Denon delivers what can safely be described – and I choose my words carefully there – as a very Denon sound. It’s not the most hard-hitting or exciting presentation of music, and there’s no shortage of rivals out there with more bite, harder edges and the ability to sound more savage when grungier music and recordings require. However, the DA-300USB never sounds dull or uninteresting; rather the balance here keeps things smooth, controlled and assured, while still revealing plenty of detail in fine recordings and giving a very mature listen. I tried the DAC both connected via USB from my Mac Mini and MacBook Air computers and (just to check functionality) on the end of a little Asus netbook loaded with the appropriate drivers, while ‘conventional’ sources included a Cambridge Audio Blu-ray player, Sony’s HAP-Z1ES hard disk player and a variety of network music playing devices, and in each case the same surefooted, confident sound was in evidence. What this DAC does is bring out the fine detail in high-quality recordings – those subtly audible cues so informative about the studio or location acoustic, the position of the performers within it and so on – while at the same time flattering the rougher stuff with the warmth and generosity of its presentation. Top-notch DSD recordings sound superb, with a fine sense of presence and timbral detail, while at the same even low-bitrate compressed music files or Internet radio streams sound perfectly listenable, even though there’s never any doubt about the underlying lack of information on offer. If your choice of music means you listen to some little internet radio station broadcasting from who knows where at 64kbps, you won’t find anything else at this kind of price level so able to render it listenable, rather than exposing its deficiencies to the point where you really don’t think it’s worth the effort. That’s the clever part of the Denon’s sound: that it manages to deliver this smoothing warmth with low-quality content, but kick down a gear or two and play hard when music at CD quality or better is on offer. This is a rather accomplished piece of equipment for the money, whether you’re looking to improve the sound of music on your computer by feeding it through a hi-fi system, refresh an old CD player, or get better sound when playing music on a DVD or Blu-ray player. 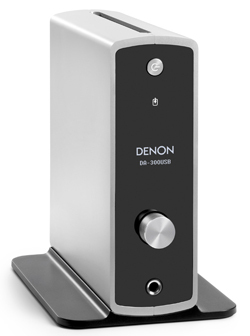 Oh, and there’s another string to the Denon’s bow: it’s an excellent headphone amplifier. Tested with a high-quality pair of ‘phones – in this case Bang & Olufsen’s fine-sounding and extremely comfortable BeoPlay H6 model – the DA-300USB proves its ability in this respect with a rich, clean and powerful bass, smooth, natural midband and an open, informative treble. The headphone provision here is far from being a makeweight, to the point that it would actually be worth buying the Denon DAC even if all you ever wanted to use it for was as a headphone amplifier, making the line-level capability the icing on the cake, rather than the cake itself. 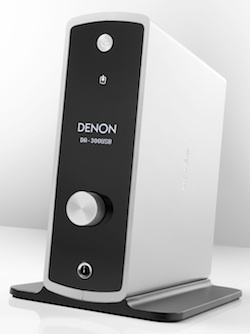 So, Denon’s first foray into the affordable desktop DAC market is a very impressive one, combining value for money with flexibility in a sleek, beautifully built package. Could one really ask for much more? Nice presentation. I wonder if it is better than Meridian Explorer as a DAC/HeadAmp. Any thoughts about it ? Haven’t done a direct comparison, as I don’t have an Explorer to hand, but the two are rather different products as the Explorer is USB-powered and the Denon has an external power supply. So the Meridian has convenience on its side, but I suspect the Denon would better it on flexibility. thanks for the review, sure got me interested more for this product. any chance you could compare this denon with the audioengine d1? So the build is fine, just his model had a problem i guess. Might be a stupid question, but could I plug an iPhone into this to improve the sound to my B&W P7’s? If so, would the standard iPhone cable suffice? There’s no direct iPhone input, but you could use the Denon with an iPod/iPhone dock designed to deliver a digital output, such as the Pure i-20.